My admiration for the music of Celer has grown seemingly exponentially since my first encounter with their work last year, in the form of Mesoscaphe, their collaboration with Mathieu Ruhlmann (subsequently highly-placed in my Best Albums of 2008). The retrospective/obituary that i wrote back in July was a first attempt to say something meaningful about their illustrious output, although i was and remain acutely aware that it barely scratched the surface. In the three months that have passed since that fateful time, as many full-length albums have been released, with yet more announced and coming soon. 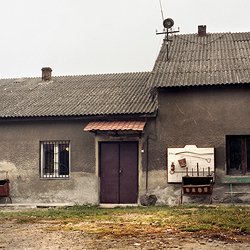 All three assume Celer’s most demanding shape, lengthy solitary tracks, the first of which, Brittle, is the longest of all, its single span lasting over 74 minutes. Its title is complemented by the track’s title of ‘Eustress’, a word that embodies the opposite of ‘distress’, referring to forms of stress from which we obtain positive effects. A short essay accompanies the CD, explicating Celer’s intentions in bringing these two evocative words, ‘brittle’ and ‘eustress’ together. And it’s extremely tempting, reading the words that refer to their aim “to demonstrate a feeling of continuation through what sometimes seems like a fragile existence”, immediately to draw connections to Dani Baquet-Long’s sudden death; but this music was obviously made before her passing, and while at the moment it cannot fail to be heard in the wake of that tragedy, it would be a facile mistake to allow that to obfuscate the music contained in Brittle, still less to define it. Celer’s music has sufficient depth and substance to stand on its own two feet, without the need for imposed emotional crutches, despite how keen one may be to impose them; i prefer to allow the music to communicate on its own terms. Stress, though, is far from the album’s opening sonic shapes, forming an undulating fabric composed of a dense cluster of tones, from which isolated pitches endlessly pulse and throb. It takes a little over a quarter of an hour before any kind of significant disquiet ruffles the music’s feathers, and for some time thereafter there’s a more noticeable (albeit gentle and understated) sense of dissonance in the texture, the beating of which dizzifies the initial clarity. All of which has proved to be merely the overture of an incredibly varied, yet ultimately familiar music, always changing yet never straying too far from its basic state. Celer speak of it acting as a “blanket”, and their aspiration is to the kind of thing at the heart of what i’ve previously called the ‘ambient tradition’, to Erik Satie’s ‘musique d’ameublement’, or as Celer prefer it, “room music”. It is simultaneously in the background, enveloping the listener in wave after wave of soft crescendi, and at the forefront of our attention, dazzling and teasing with its hypnotic shifts of colour. The difficulty that this kind of material presents—and it is a profound difficulty—is how to bring it to an end. It would be easy to imagine “Eustress” playing on into eternity, but this isn’t realistic; at some point, it must come to an end, and we must take our leave of it. It’s comforting therefore to read Celer’s assertion that this music “shouldn’t leave or transport you to another place”; Brittle very much has its feet on the ground, keeping reality, with all its fragility and transience, at its core. It’s a reality given space in the album’s final three minutes of silence, and aptly captured in the prosaic but rather beautiful cover photograph. The second and third albums emerged together, and have equivalent durations (between 40 and 50 minutes) but occupy utterly different sound worlds. Whereas Brittle hides its sources as well as its supposed original 19 tracks within a seamless, electronic façade, Fountain Glider‘s 22 parts, each of which has a title, are rather more distinct, and its sources more apparent. However, the choice of a single track signifies something different from, say, Capri or Nacreous Clouds; Fountain Glider is intended to be heard whole and complete. The stated inclusion of, among other things, recordings of a “glider cabin during flight” as well as “runway wind” immediately suggests a music more influenced by the noise end of the sonic spectrum. And from the outset, this is the case, the surface flecked and scuffed by the rougher edges of these noisome sources, which also play fast and loose with the stereo width, at times combining narrow and wide layers simultaneously (particularly effective through headphones). These kinds of complex timbres, rich in overtones, sound even more sharp due to their contrast with softer episodes, some of which occupy similar territory to that on Brittle. However, even within these smooth, mellifluous textures, noise still seems to be present at its epicentre, unifying the parts into a cohesive whole. Some of the transitions are sublime, such as that from “Leftover Thunderhead” into “Drift-off” (at around the 7-minute mark), where assertive pitches yield to a rather ghostly, claustrophobic air ambience, that also introduces the first significant low frequencies on the album; and it then dissolves, three minutes later, into even greater stillness with the beautiful stasis of “Radio Haze”. 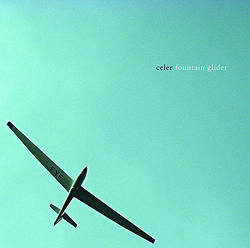 For all the diversity of Celer’s previous output, they’ve not released anything quite like this, and indeed Fountain Glider comes across as something of an experiment. It’s taken numerous listenings to conclude that it does work—but not, i think, as ambient music in the same sense as Brittle. This isn’t an album that benefits much from being played as “room music”; maybe it’s the presence of the noise elements, but overall Fountain Glider has a tendency to draw one’s attention that means it really needs to be listened to actively. Then, the fascinating interplay between hard and soft timbres becomes highly engaging, and the control over the episodic nature of this music is revealed to be masterly. Alongside Sieline, it’s one of their more courageous releases, which may well alienate those for whom ambient music is nothing but the aural equivalent of soft pillows and sleeping pills. But i think this could well rank among their finest work, and it’ll be interesting to hear if future releases explore similar territory. 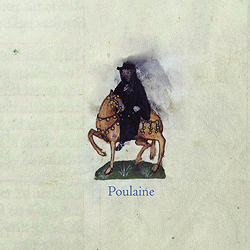 Poulaine was composed to accompany an exhibition of 14th Century manuscripts at the University of California at Irvine. The number of manuscripts equates to the number of parts heard here—13—although once again placed within the context of a single track. Despite originally being separate, in their assimilated whole the beginning and end of each of the 13 parts is often hard to pinpoint with any accuracy. But this is no bad thing; Poulaine heralds a return to Celer’s drone-like music, without a hard edge in sight, and the lack of distinct boundaries to the work’s component parts aids the music to this end. No doubt the gentleness of the material can be in part attributed to its functional role within the original exhibition; in this new context, it is in some ways the opposite to Fountain Glider, deflecting one’s attention off its impeccably smooth surface, almost resisting one’s attempts to engage with it. To some extent, it doesn’t help having the distinct and imaginative sound sources listed—cello, violin, theremin, contact mics on oil paintings, piano, field recordings, etc.—as every one of them has been processed beyond all recognition. What Poulaine seems to be crying out for is a simple, subjective engagement, where thought is put on hold and the mind can instead bathe in one beautiful wave after another. Indeed, it could be argued that Poulaine more emphatically achieves that to which Brittle so keenly aspires, to the sensation of “acting as a warm comfort”. Except that, as the piece progresses, something different becomes apparent; far from there being nothing to engage with, the reality is quite the contrary. For all its apparent ‘neutrality’, there’s a great deal going on within this texture, but of a more subtle magnitude than on either Fountain Glider or Brittle (one example: the soft, high note that emerges at around the 6-minute mark; a delicious moment). If music as amorphous as this can be said to be ‘doing’ anything, later on in the piece the music seems almost to be trudging forward, bestowing on it a rather unsettling, troubled quality. i like it all the more for this; and it underlines why Poulaine (like the other two albums discussed here) is to be heard in its entirety; the opening portions of the work are very far from the whole story. And far from being a “warm comfort”, the music here is demonstrably aloof; gorgeous and delicate it may be, but shining with the quality of a cold, distant star. It’s astounding and a huge delight to be able to listen to music of such quality, to which so much care and attention has been given. While i hope that Will Long will allow himself plenty of time to release Celer’s remaining output, each new release is genuinely exciting, and proves the extent to which he and Dani have honed their craft; without doubt, these are among their best releases to date. Brittle is available from Low Point records, as is a companion piece titled Mane Blooms, soon to be released. Both Fountain Glider and Poulaine, released in editions of 100 copies each, sold out on the same day they became available; copies might still be obtainable from Infraction, who are usually the best place to try for Celer’s music.